As with all the kits in Fujimi's Super Mechanic series, emphasis is on the electrics: the model can be fitted with a rather big Mabuchi RE-26 motor and the recess in the floorpan will hold upto 3 AA batteries. With that much battery power you might as well put the optional wheat bulbs in head and tail lights too. The batteries claim most of the simplified floorpan and interior tub, although Fujimi supplies a rather nice looking steering wheel, a mediocre shift lever and a simple straight dashboard to dress up what's left of the interior. These are simple kits, but accuracy of the body is quite good. 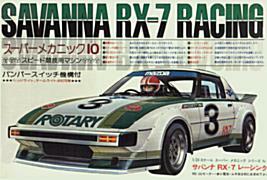 The color scheme of these Rx-7 racers appears to be a factory standard scheme: an off-white/ivory base color (Tamiya TS-7 Racing White is a good match) with either green, red or blue striping. Note that there is some variation in the actual striping patterns. 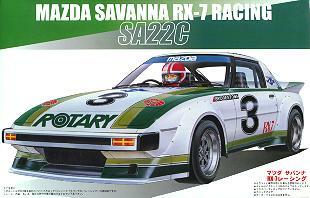 This kit represents a factory team racer as it ran in the Japanese Sportscar Championship in 1978 and 1979. Another version of this racer was released as kit ID-1. The floorpan in the ID-series kits differs from the one in the SM-series, a full interior tub is offered and although the ID models can be motorized, the batteries (2x AA) are now hidden in the nose. This kit was rereleased in January 2004, it does not appear to belong to a series so it will be a limited release. It is almost identical to the Tohge RX-7 SA22C kit, the only differences are additional decals for the racing livery (the Tohge decals are still included to provide the dashboard decal) and the semi-slick Advan tires in the Tohge kit are replaced by full racing slick tires. This time the quality of the racing decals is at least as good as of those offered by Testors. 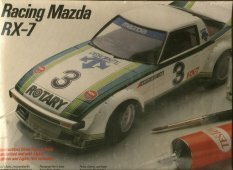 This is a limited release, the kit contains all of the parts of the previous RX-7 SA22C Racing kit apart from new wheels and tires and new decals. The wheels are very nice 3-part SSR Speed Star Mk.III wheels that come in two sizes: regular sized and wide ones, 4 each. There are 4 regular width tires and 2 wide tires included to offer a choice of regular width wheels all around or regular front wheels with wide rear wheels. The Daytona race car ran wide rear wheels. ConceptCarz.com shows the car being driven around Laguna Seca. Supercars.net shows some great close-ups. Note that to turn this kit into the actual race car you need to change the dashboard and seats, delete the rear seat, fit a large racing fuel tank in the trunk and replace the slightly slanted, profiled tires with racing slicks. This kit is a rebox of Fujimi's ID-1 kit with better quality decals than the original Fujimi ones (same subject i.e. 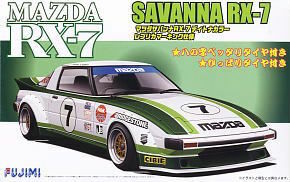 a Japanese Sportscar Championship version rather than the similarly looking 1979 Daytona GTU class winning number 7 car).